Marsh-marigold is not easily confused with other wild plants on this web site. 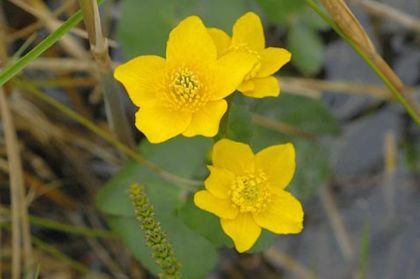 Also known as Kingcup, Marsh Marigold is most often found in soggy, ground such as wet woodland, ditches, stream margins, ponds, bogs and marshes. It is a perennial plant with striking, shiny golden flowers (10-50mm across) from April to July, each flower comprised of 5 – 9 oval sepals, there being no petals and at the centre of each are numerous stamens crowded together. The flowers are held in loose, clusters on stout, hollow stems which also bear deep green, kidney shaped, fleshy leaves which increase in size after the plant has flowered. This is a native plant, it is poisonous and it belongs to the family Ranunculaceae. My first record of this wildflower is in 1978, growing alongside a small stream which flowed into the Vartry Reservoir at Roundwood, Co Wicklow. I photographed it 30 years later at Pollardstown Fen, Co Kildare. This wildflower was formerly known as 'Mary gold' with reference to the Virgin Mary and was used in earlier times in celebration of her at Easter. The juice in this plant is caustic and was used as a remedy in folk medicine to encourage warts to fall off. 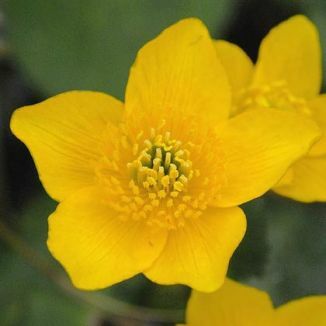 'In County Leitrim, Marsh-marigold is known as May flower and on May Eve (30th April) the tradition was that these flowers were placed at the entrance or on window-ledges of homes and farm-houses to ward off evil. It is still a reasonably common practice in some area'. This piece of folklore was sent to me by John McGurrin whose home county is Leitrim.